Thanks so much, Ashley! Order your photos now at smugmug. Categories: General	| Comments Off on PHOTOS are here! There are numerous examples of crowdsourcing transcription websites with a variety of functional depth to them. How should we approach oral and videohistories in order to achieve a similar or better degree of success? Is there a means to make the output immediately accessible to researchers beyond a static transcription. 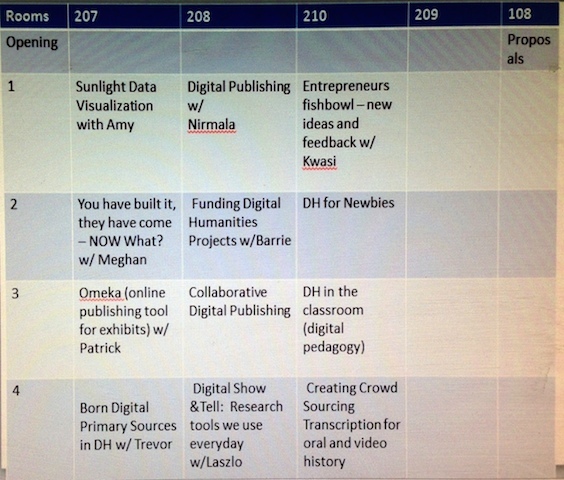 For this session, I’d like to brainstorm about building a resource to introduce digital humanities to DH newbies. This would be part of a wider conversation about how to introduce the topic to people who perhaps feel overwhelmed by the technologies the DH community is using. The idea for this session came to me a few months ago after attending “Toolkit for THATCamp newbies, Dreambook edition” at last year’s THATCamp Prime at GMU. During that session, several campers kept asking basic questions about how to get started in the digital humanities. There were excellent, well informed answers from campers who have experience with coding and know about resources that are common to the DH community. Why don’t we continue the conversation and come up with a list of tools and technologies that everyone interested in DH should know? I’d like to propose a dork short to discuss Remembering Lincoln, the digital project I’m coordinating at Ford’s Theatre. Remembering Lincoln is bringing together responses to the Lincoln assassination from the 13 months after it took place. We are currently a bit over six months into a grant from IMLS to plan the project. In this dork short, I’m happy to discuss the project’s progress so far, touching on sometimes contentious discussions over crowdsourcing (broadly defined), recent audience research to define what we are doing for the final site, working with a dozen partner organizations, and launching a “preview” of the project–with an unexpected and exciting result. I would like to introduce Digital Humanities Now, a weekly publication that distributes news and work of interest to digital humanities folks in research, education, libraries and archives, and cultural heritage organizations. We rely on volunteers to review the posts that we aggregate from nearly 700 RSS feeds, as well as look through their own networks, to nominate pieces for broader distribution. I can share a bit about how we work and how we are helping other communities create their own curated publications. In my day job I work on digital preservation, that is, ensuring long term access to digital information. 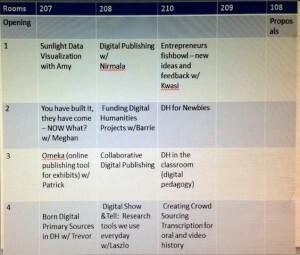 Aside from that, I spend a lot of time participating in and listening in on conversations in the digital humanities. I feel digital preservation and the digital humanities aren’t in nearly enough conversation. There is a lot of work focused on analyzing digitized texts, but there remains surprisingly little focused on the study of a range of born digital materials. Interestingly, the folks doing most of the work with born digital materials often tend to be working in fields like sociology, anthropology and have more of an affinity with the social sciences. So, I’d love to have a session where we talked a bit about the kinds of research and scholarship humanists could do based on born digital materials. I figure in the session we can discuss some of these examples, add some more to our list, and think about what kinds of research and perspectives that humanities scholars could bring into analysis and exploration of these and related sources. I’d like to offer a session on “Workflow for Digital Humanities Publishing,” based on my experience working on the German Historical Institute’s Immigrant Entrepreneurship project, an online collection of biographical articles on German-American entrepreneurs (www.immigrantentrepreneurship.org). We rely on a combination of in-house staff and external authors and editors. It would be great to discuss some of the issues we’ve encountered with people who are working on, designing, or have completed similar projects, whether on a larger scale or a much smaller scale. Barrie Howard has been involved in grant-funded digital humanities projects on both sides of the table for a decade. He will lead a breakout session on a range of issues from grant seeking to grants administration and project management. In the spirit of the THATcamp unconference format, he would like input from session participants on the format of the session as to whether it manifests as a Make, Talk, or Teach event. Barrie has created a dataset on grants funding of digital preservation projects from ca. 2000 to the present, and is interested in ways to expand and share the data. Here’s my proposal idea, it’s an educational platform where people can study together online based on hashtags. Meaning users “enroll” by picking an interest ( academia, arts, science, sports etc) and then they will get a social media syllabus that will direct them to content about their interest. I’ve been experimenting with this concept on social media platforms such as tumblr and instagram and would love to hear some feedback. All text and code on THATCamp DC 2014 is freely available for you to use, copy, adapt and distribute under a Creative Commons Attribution 3.0 Unported License as long as you link to THATCamp.org and the Center for History and New Media. The name "THATCamp" and the THATCamp logo are trademarks of the Center for History and New Media at George Mason University.